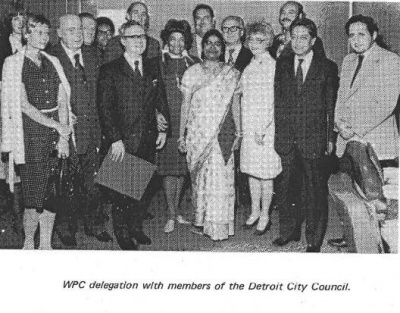 On December 15, 1981, Ron Dellums' then assistant, Barbara Lee, wrote to the World Peace Council asking for airline tickets and hotel accommodations for Dellums and two staff members to attend the WPC Conference in Vienna. The letter was addressed to Karen Talbot, an American working for the WPC in Helsinki. Talbot was formerly business manager of Peoples World, the Communist Party USA newspaper, published in Dellums' district. On March 30 2002 the Communist Party USA paper People’s Weekly World called for a national holiday in honor of late Farm Workers Union leader Cesar Chavez. The article was followed by a long list of endorsersincluding Karen Talbot, Almost all endorsers were confirmed members of the Communist Party USA. At the Committees of Correspondence National Conference and Convention, July 25-28, 2002 San Francisco State University. Disarmament and the Military Budget. Panelists included: Kenneth Riley, David Bacon,, Marilyn Albert, Renee Saucedo, Angela Sambrano, Cathi Tactaquin, Marty Price, Patrice Sewell, Joan Cohen, Claire Carsman, James Campbell, Peter Orris, Thelma Correll, Edith Pollach, Amaha Kassa, Harry Targ, Steve Williams, Karen Talbot, Mort Frank, David Cohen. This page was last modified on 4 June 2011, at 13:09.